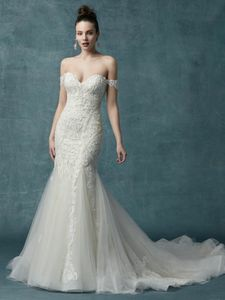 Description: This vintage-inspired wedding gown features a bodice of pearls and beaded lace motifs, drifting into a tulle fit-and-flare skirt. Delicate lace motifs adorn the strapless sweetheart neckline. Finished with covered buttons over zipper closure and inner corset. Cap-sleeves accented in beaded lace motifs sold separately.